TORONTO – At long last, the future of Casa Loma may soon be decided. The Kiwanis Club ran the landmark for 73 years, but the city scrapped the agreement about two years ago — and Toronto City Hall has been accepting proposals ever since. Now, officials with the city and Liberty Entertainment Group are discussing a 20-year deal to install a fine dining restaurant and banquet hall in the 98-room Edwardian landmark. The financial terms of the deal are not yet known, but CityNews has learned at least $7-million will be invested by Liberty Entertainment Group to renovate the tourist attraction. Under the proposed agreement, a “high-end restaurant” will operate in the west-side of the building, Coun. Joe Mihevc told 680News. “The rest really will be much the same. It will still be a tourist attraction. There will be banquet facilities as there are now,” he said. Air conditioning will be installed in several renovations that will be the responsibility of Liberty Entertainment should the proposal be approved by city council, he added. “People will enjoy it, I think, a lot more because the amenities will be upgraded and it will be used more often than it is now,” Mihevc said. He said the coach house, horses’ stables and potting shed are not part of the proposal but it will allow the city to consider development for the area as the site of a Toronto museum. It will be debated at the executive committee meeting on Oct. 30. Click here to read the agenda. If approved, city council would consider the plan at its meeting on Nov. 13. “You never know with this council if there will be opposition but I suspect given that there is good financial return for the city, given that Casa Loma will be used more often and become a well-loved place — not just for that one time that people go to it but many more times than has been the case up to now — I think councillors will find this an exciting proposal and will work with it,” Mihevc said. The Liberty Group operates the Liberty Grand ballroom at Exhibition Place, the Rosewater Supper Club and the Phoenix Concert Theatre. 1911: Financier and industrialist Sir Henry Pellatt draws up plans with architect E.J. Lennox to build his dream castle. 1914: Casa Loma is completed after three years, using more than 300 men and $3.5 million. The private home is filled with artwork from Canada and around the world. 1924: Sir Pellatt and his wife Mary are forced to auction off the contents of Casa Loma due to financial hardship. 1933: The City of Toronto seizes Casa Loma after roughly $28,000 was owed in back taxes. 1937: After being leased by the city and restored by the Kiwanis Club of Casa Loma, Casa Loma opens as a tourist attraction. June 2011: After more than seven decades, city council agrees to end management deal between the city and Kiwanis Club and look for long-term strategy for Casa Loma. 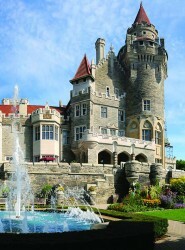 October 2012: A request for proposal is issued to find a suitable operator for Casa Loma. October 2013: City staff recommends that council broker a deal with Liberty Entertainment Group to improve and manage Casa Loma’s main house and grounds. This entry was posted in 2013 News. Bookmark the permalink.